Sorry this post is so late. I have been gone most of the day. I had a morning call from a friend asking me to help her with a stamping party. “Paper and Ink? Heck yeah, I’m there.” This evening I had a meeting and then dinner with friends. It’s so nice to spend time with people who know all your warts and love you anyway. Scooter couldn't help me with the giveaway. As you can see from his photo, he was exhausted from his haircut. I went with a random number generator that I found online. I didn’t remember to copy the image so you’ll just have to take my word for it that the drawing was on the up and up. The winner is Cheryl L. Congratulations, Cheryl. Please email me with your address and I'll sent your stencil along. by my blog and comment. I would never have dreamed three years ago that I’d have a blog that has been visited over 30,000 times. 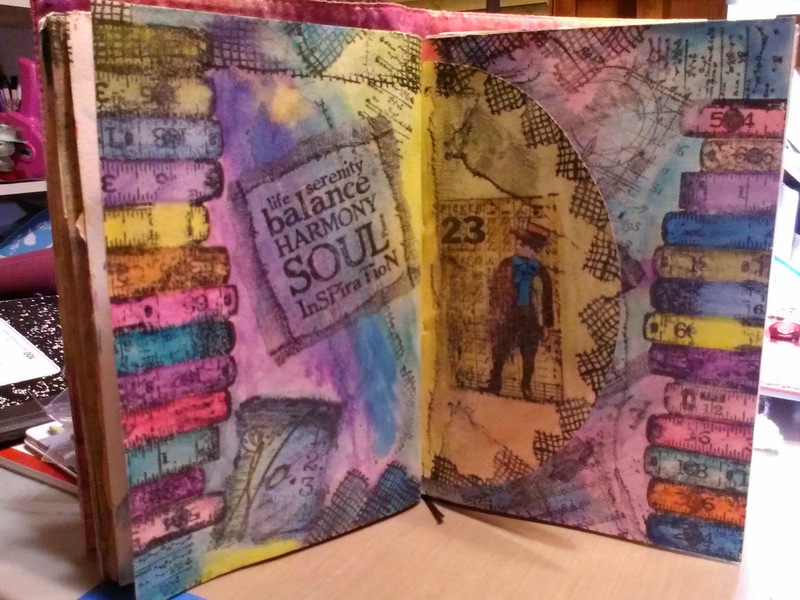 It also never occurred to me when I started art journaling that one of my pages would be published in a book. Here are my thoughts on the publishing thing….. Do what you love. Create art that makes you happy. Use color, paper, paint and texture that speak to you. The important part is that you enjoy yourself as you are creating. If someone along the way likes it enough to publish it, then that is icing on the cake. You've already had the joy of being one with your art and it is just gravy that someone else likes it too. In the past, I've tried to make a pieces because I thought they were something a magazine might like. Those pieces never made me happy. I didn't enjoy the process of making them and they were never quite right. 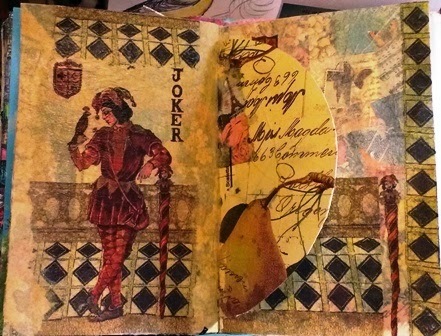 The page that was chosen for the book was a page I did just because I wanted to play in my journal. That was the only motive behind that page. The funny part is that I didn't think it was the best of the pages that I submitted. Appreciation of art of very subjective. It's all in the eye of the beholder. I am very happy that the editor liked my page enough to include it in the book. It is wonderful for my peers to like my work. I love it that all you visit my blog and like my work and take the time to read my words. The art as well as the words come from my heart...that place inside me that wants to jump for joy at the thought of getting my fingers into the paint and glue. The kid inside me is the artist. She is in full play mode every time I pick up a paint brush in my studio. I hope you enjoy your time in your studio as much as I do. What a wonderful gift God has given to me. The ability to express myself with bits of paper and colorful paint. The kid inside me likes the kid inside you and says "Hi!". Congrats again on being published and congrats to Cheryl L for the blog candy. Thank you, Linda. I love it when the kids come out to play. So excited! Can't wait to get it! Thanks, Boo!